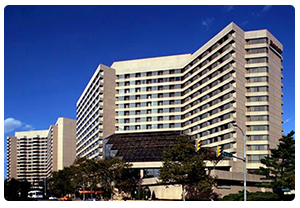 WSC 2016, December, 11-14, will be held at the Crystal Gateway Marriott in Arlington, Virginia. The hotel is located minutes from downtown Washington, DC and less than 1 mile from the Reagan National Airport. The Metro is connected to the hotel which makes exploring the area’s monuments, museums, shopping and restaurants very convenient. Room Rate: $189 plus taxes (single/ double occupancy) Rate includes guest room wireless internet. A limited number of rooms have been blocked at the special WSC rate. We anticipate that rooms will sell quickly and advise you to make reservations early, well before the cut-off date of November 14. After that date, reservations will be accepted at prevailing rates on a room available basis. Reservations may also be made directly with Marriott reservations at (800) 228-9290 or (703) 920-3230. Please mention the Winter Simulation Conference for the WSC rate. On-site parking is $13 USD hourly, $27 USD daily. Valet parking is available for $32 USD daily. For more information go to http://www.marriott.com/hotels/maps/travel/wasgw-crystal-gateway-marriott/. WSC 2016 Alert: Fraudulent Room Reservation Deals We have learned that once again some people are receiving phone calls from an agency claiming to be the WSC hotel room booking agent. Please note that the only way to make reservations at the special conference rate is by using the link above or calling directly into the hotel. If you have already reserved with these companies, be alert for fraudulent charges on your credit card. Driving Directions: Turn right onto Airport Access Rd. Slight right toward Crystal Dr. Continue straight onto Crystal Dr. Turn left onto 18th St S. Turn right onto S Eads St. Destination will be on the right. *** For GPS mapping, use 1601 South Eads Street as the hotel’s address. Driving Directions: Exit the airport onto the Dulles toll road and proceed to Interstate 66 East. From Interstate 66 East exit onto Route 110 South and follow the signs to US Highway 1 South. Continue on US Highway 1 South to the 15th Street exit and turn right at the end of the off ramp. At the first traffic light turn left onto South Eads Street and the hotel is one half mile on the left. Driving Directions: Take Interstate 195 West. Take exit 2B for MD-295 S/Balt/Wash Pkwy toward Washington. Continue onto I-295 S. Take exit 3B for Howard Rd toward Nationals Park/Downtown. Turn right onto Howard Rd SE. Take the ramp to National Park. Slight right onto S Capitol St SE. Take the I-395 S ramp to Richmond/Downtown. Merge onto I-695 W. Continue onto I-395 S. Take exit 8C on the left to merge onto U.S. 1 S toward Pentagon City/Crystal City/Alexandria. Take the 15th St S exit toward Pentagon City. Turn right onto 15th St S. Take the 1st left onto S Eads St. Destination will be on the left.